In Buckeye AZ, in the west valley of Phoenix, lies the development of Verrado. It is virtually a town of its own and boasts two Tom Lehman Golf Courses. The Founders Course which has been open just over 10 years, and The Victory Course which opened in Feb 13, 2017. 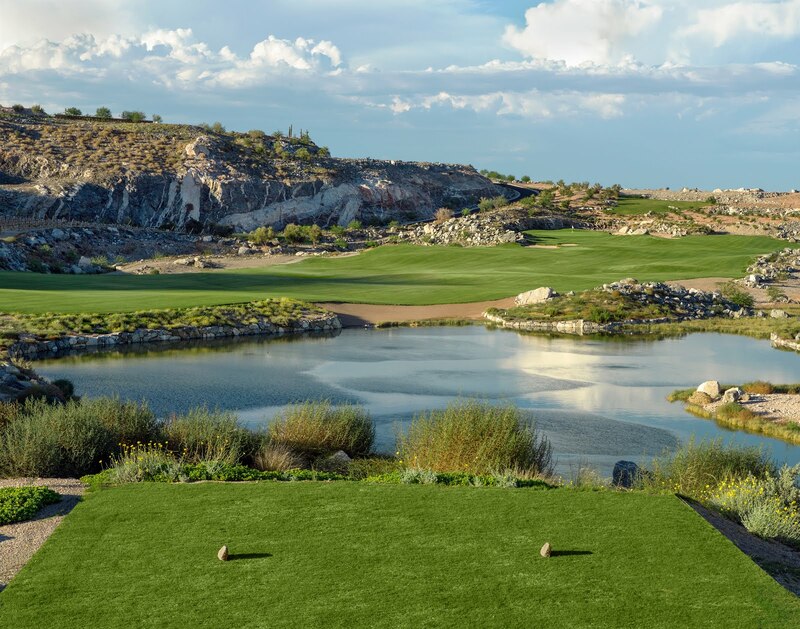 This may be the first new golf course in the Phoenix are in over 10 years. There are no houses around this course yet, until you come to number 15 which is framed by homes. Strangely enough the houses are set back far enough and placed in such a way that they actually enhance the attractiveness and the definition of the hole. The views are dramatic, as you are almost cradled in the White Tank Mountains. I expected a course with lots of elevation changes, but the course is relatively flat with plenty of rolling fairways providing subtle elevation changes, That is until you come to 17 and 18— two wonderful finishing holes. 18 is the only hole with water in play and it is a challenging beautiful finish to a wonderful round of golf. The fairways feature generous landing areas. So for those of us who don't drive the ball perfectly straight, its very forgiving, There is plenty of challenge from there in, however, even though there are less than 25 bunkers on the course and water on only one hole. If there is any rough, I can’t remember it. It was quite windy the day we were there and with its proximity to the White Tank Mountains, I would guess that wind is not uncommon. We were into the wind for 5 holes and on #6 we finally got a downwind break. 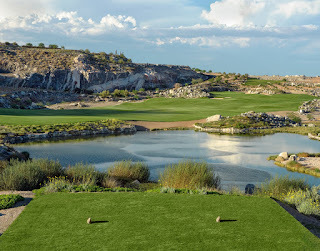 Rock outcroppings and boulder fields, are clearly one of the defining points of Victory at Verrado, not only lining the holes but in the fairways as well— they definitely enhance the course, but be careful not to hit your ball behind one of them (especially on holes like number fourteen which turns a drivable par four into a real challenge). This course would be a challenge to walk, there are some pretty substantial distances from green to the next tee, but they do have concrete cart paths, some of which, were still dirt from green to the next tee. (I assume that will change when the housing development is finished). Bring you best putting game because the greens have plenty of movement in them with some very challenging pin placements on very large greens, the deepest being 51 yards (that is at least a 3 or 4 club difference) To put that in perspective, there are kickers in the NFL that can’t make a field goal from that distance. There are 9 sets of tee boxes all the way from 7258 yards to 4646 yards. All skill levels should find fun and challenge here. Victory at Verrado is operating from a temporary clubhouse with the new clubhouse scheduled for completion in late fall of 2017. They are not planning any GPS on the carts and the course is not fully uploaded for our personal GPS devices- Get a progress report when you book your tee time. (The sprinkler heads are very well marked, however). If you find airplane noise disturbing, this may not be the place for you. Luke Air Force base is no more than 10 miles away, and we heard the roar of jet engines over head at least 1/2 dozen times during our round. However if seeing several formations of F-15 and the new F-35 fighter jets is exciting for you, then this may be exactly the place for you. To me they were a treat to watch and a welcome distraction after a wayward golf shot. Tom Lehman has designed a very playable course here with wonderful mountain vistas— Call them and check it out.